Why Join a Hunting Club? While access to good hunting ground becomes harder to find every year, you can be guaranteed easy access to private hunting grounds and may hunt as many pheasants, chukar and quail as you wish at Oak View II game bird hunting preserve. You will also enjoy an extended hunting season, from September 1st through March 31st, with no bag limits. 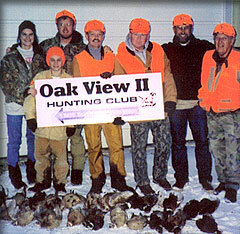 Oak View II hunt club is located 14 miles southeast of Des Moines, Iowa, has 600+ acres of prime hunting ground. In addition, we carry an excellent stock of pheasants, chukar and quail, which you may choose to hunt. Extra birds are available at reduced rates. Guides and dogs are available at an extra charge. All members and other parties are asked to call ahead for reservations. This assures you of an uncrowded place to hunt and a guide or dog if needed. Members have the right to train or run their own dogs on the hunting preserve. Extra birds are available for training dogs. Members and guests must adhere to the rules and regulations of the club. All hunting parties will be required to sign club waiver and release forms.